Abalone: The Native American Cultural Center of California (NACC) - Serves the American Indian community and the general public in the San Francisco Bay Area and California generally. On this site are American Indian events, arts, education materials, programs, maps, and galleries, with a special focus in California Indian dance, song, and rock art. NACC also lists Native Spring events. American Indian Heritage Foundation (AIHF) - Established to provide relief services to Indian people nationwide and to build bridges of understanding and friendship between Indian and non-Indian people. American Indian Population and Labor Force Report - From the Bureau of Indian Affairs. American Indian Tribal Directory - A complete listing of Federally Recognized Tribes and location in U.S. Assembly of First Nations (AFN) - Canadian national organization representing First Nations citizens in Canada. Bureau of Indian Affairs (BIA) - U.S. agency whose mandate is to protect and improve the trust assets of American Indians, Indian tribes and Alaska Natives. California Native American Heritage Commission - Preservation and protection of Native American human remains, grave goods and cultural resources. Federal and state laws and codes, local ordinances and codes. Edward S. Curtis's North American Indian - The North American Indian by Edward S. Curtis is one of the most significant and controversial representations of traditional American Indian culture ever produced. In over 2000 photogravure plates and narrative, Curtis portrayed the traditional customs and lifeways of eighty Indian tribes. The twenty volumes, each with an accompanying portfolio, are organized by tribes and culture areas encompassing the Great Plains, Great Basin, Plateau Region, Southwest, California, Pacific Northwest, and Alaska. Featured here are all of the published photogravure images including over 1500 illustrations bound in the text volumes, along with over 700 portfolio plates. Images of Native Americans - A panorama of images selected by UC Berkeley's Bancroft Library: iillustrations from rare books, pamphlets, journals, pulp magazines, newspapers, and ephemera in addition to selections of original photographs, including stereographs, lantern slides, and cyanotypes. Indian Country: Today Media Network - A leading Native American Indian news source. Indian Health Service - Agency within the U.S. Department of Health and Human Services responsible for providing federal health services to American Indians and Alaska Natives. Indian Land Tenure Foundation - A community-based nonprofit organization focused on the recovery, management and control of American Indian lands by Indian people. Indian Trust: Corbell v. Norton - Cobell v. Norton is a class-action lawsuit filed on June 10, 1996, in U.S. District Court in Washington, D.C. to force the federal government to account for billions of dollars belonging to approximately 500,000 American Indians and their heirs, and held in trust since the late 19th century. Through document discovery and courtroom testimony, the case has revealed mismanagement, ineptness, dishonesty and delay by federal officials, leading U.S. District Judge Royce Lamberth to declare their conduct "fiscal and governmental irresponsibility in its purest form." Indianz - Resources about Native American/American Indian tribes in the United States and Alaska and First Nations communities in Canada. Indigenous Environmental Network (IEN) - Formed by grassroots indigenous peoples and individuals to address environmental and economic justice issues. IEN's activities include building the capacity of indigenous communities and tribal governments to develop mechanisms to protect our sacred sites, land, water, air, natural resources, health of both our people and all living things, and to build economically sustainable communities. Indigenous Governance Database - Resource center for Native nation leaders, key decision-makers, employees, citizens, and others in search of educational and informational resources about nation building, sovereignty, governance, leadership, and sustainable economic and community development in Indigenous country. International Indian Treaty Council (IITC) - Committed to securing U.S. recognition of treaties signed with native nations. Iroquois - Wikipedia article: "Also known as the Haudenosaunee or the "People of the Longhouse", are an indigenous people of North America. In the 16th century or earlier, the Iroquois came together in an association known as the Iroquois League, or the League of Peace and Power. The original Iroquois League was often known as the Five Nations, and comprised the Mohawk, Oneida, Onondaga, Cayuga, and Seneca nations. After the Tuscarora nation joined the League in the 18th century, the Iroquois have often been known as the Six Nations. The League is embodied in the Grand Council, an assembly of 50 hereditary sachems." National Congress of American Indians (NCEA) - Established in 1944 in response to the termination and assimilation policies the US government forced upon tribal governments in contradiction of their treaty rights and status as sovereign nations. To this day, protecting these inherent and legal rights remains the primary focus of NCAI. Also see Tribal Directory database. National Indian Gaming Association (NIGA) - A a non-profit organization of 168 Indian Nations with other non-voting associate members representing organizations, tribes and businesses engaged in tribal gaming enterprises from around the country. NIGA operates as a clearinghouse and educational, legislative and public policy resource for tribes, policymakers and the public on Indian gaming issues and tribal community development. National Museum of the American Indian (NMAI) - The sixteenth museum of the Smithsonian Institution. It is the first national museum dedicated to the preservation, study, and exhibition of the life, languages, literature, history, and arts of Native Americans. The museum's extensive collections, assembled largely by George Gustav Heye (1874-1957), encompass a vast range of cultural material-including more that 800,000 works of extraordinary aesthetic, religious, and historical significance, as well as articles produced for everyday, utilitarian use. The collections span all major culture areas of the Americas, representing virtually all tribes of the United States, most of those of Canada, and a significant number of cultures from Central and South America as well as the Caribbean. Chronologically, the collections include artifacts from Paleo-Indian to contemporary arts and crafts. The museum's holdings also include film and audiovisual collections, paper archives, and a photography archive of more than 300,000 images depicting both historic and contemporary Native American life. National Register of Historic Places Program - This site showcases historic properties listed in the U.S. National Register, National Register publications, and National Park units that recognize the events and lifeways, the designs and achievements of American Indians. Native America Legal Resources - Part of the WWW Virtual Library - American Indians. Native American Public Telecommunications - Informs, educates and encourages the awareness of tribal histories, cultures, languages, opportunities and aspirations through the fullest participation of American Indians and Alaska Natives in creating and employing all forms of educational and public telecommunications programs and services, thereby supporting tribal sovereignty. Native American Rights Fund (NARF) - Provides legal representation and technical assistance to Indian tribes, organizations and individuals nationwide. Also see NARF Publications. Native American Times - Native American news in the U.S. Native American Treaties and Information - Resources collected at the University of Colorado, Boulder. Native Nations Institute for Leadership, Management, and Policy (NNI) - Founded in 2001 by The University of Arizona and the Morris K. Udall and Stewart L. Udall Foundation as a self-determination, self-governance, and development resource for Native nations. NNI's mission is to assist in the building of capable Native nations that can effectively pursue and ultimately realize their own political, economic, and community development objectives. NativeWeb News Digest - News aggregation powered by Moreover. National Museum of the American Indian (NMAI) - The Smithsonian's National Museum of the American Indian is dedicated to the preservation, study, and exhibition of the life, languages, literature, history, and arts of Native Americans. Native Peoples Magazine - Devoted to the arts and cultures of the indigenous peoples of the Americas. North American Indian by Edward S. Curtis - From Library of Congress: "Issued in a limited edition from 1907-1930, the publication continues to exert a major influence on the image of Indians in popular culture. Curtis said he wanted to document "the old time Indian, his dress, his ceremonies, his life and manners." In over 2000 photogravure plates and narrative, Curtis portrayed the traditional customs and lifeways of eighty Indian tribes. 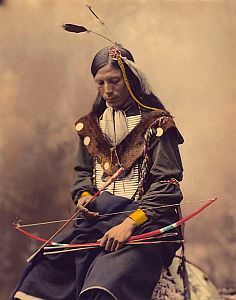 The twenty volumes, each with an accompanying portfolio, are organized by tribes and culture areas encompassing the Great Plains, Great Basin, Plateau Region, Southwest, California, Pacific Northwest, and Alaska. Featured here are all of the published photogravure images including over 1500 illustrations bound in the text volumes, along with over 700 portfolio plates." Office of Indian Education (OIE) - Supports the efforts of local educational agencies, Indian tribes and organizations, postsecondary institutions, and other entities to meet the educational and culturally related academic needs of American Indians and Alaska Natives in US. Pueblo Indian - Covers the prehistory, and history of the Pueblo Indian civilization, but also includes modern-day Pueblo Indian resources and links sections. Russell Means Freedom - Russell Charles Means (born November 10, 1939) is an activist for the rights of Native American people. Means has also pursued careers in politics, acting, and music. In 1968, Means enrolled in the American Indian Movement, and would become one of the most prominent leaders within the organization. Since the late 1970s, Means has often supported libertarian political causes, in contrast with several of the other leaders of AIM. School of American Research (SAR) - Center for advanced studies that supports the study and practice of anthropology and Southwest Indian arts. Tracking the Buffalo - Explores the role of the buffalo in the lives of the American Indians of the northern plains. Treaty With the Six Nations, 1794 - A treaty between the United States of America, and the tribes of Indians called the Six Nations. WWW Virtual Library - American Indians - Provides information resources to the Native American community. This webpage last updated on Thursday, July 6, 2017 8:08 PM.